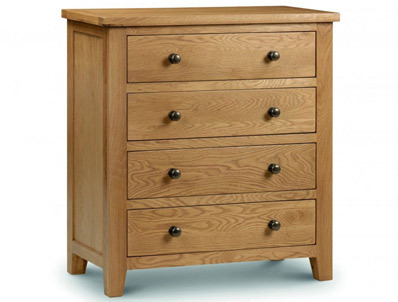 The marlborough is a new range of bedroom furniture from julian bowen it is made from solid american white oak and oak veneers and is delivered fully assembled. The marlborough 4 drawer wide chest offers a attractive chest for the bedroom with 4 equal size drawers. Delivered assembled.